God, you are in it all. If I truly believe that, that means that my heart should praise Him equally in times of triumph and trial, right? Instead, in difficult times this past winter--of illness and injury and the stresses that accompany them, I treated prayer as more of a bargaining game. 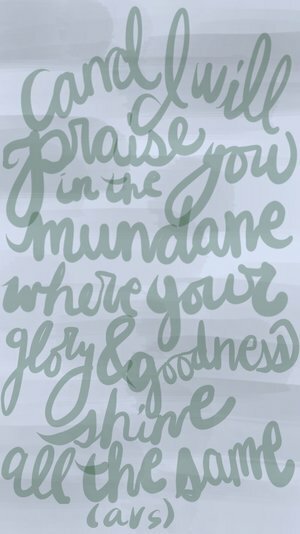 I would agree to praise Him... so long as I could understand His reasoning behind the unpleasantries in my life. And though Luke 4:12 warns us to not put God to the test, I could feel my spirit rebelling. But God in his great grace reached down and spoke truth into my life through Psalm 119 which says that God afflicts us in his faithfulness (119:75). This truth came to me at a crucial time, and I could feel the conviction that I had not been trusting in God's goodness. It took a few more months of this back-and-forth before truly surrendering my own understanding and realizing that His thoughts are higher than my thoughts, and His ways are higher than my ways (Isaiah 55:9). And it was in this act of surrender that I began to see his glory all around me. You see, trusting in his faithfulness does something to our soul. We become people of hope. It brings beauty into our living and calms our anxious spirits. So, if he is good in the good times, and good in the bad times, that leaves everything in between. I wrote this poem shortly after surrendering to the truth that God is present in it all. And He began to open my eyes to His beauty in the trees and the sky, in relationships, and in all the other things that are always around, but not fully appreciated as gifts from above. Praise Him! He is for our good, and he is in it all, my friends.